MARCH 29TH - NO SHOW APRIL 6TH. 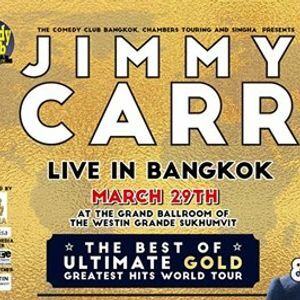 The Comedy Club Bangkok, Chambers Touring and Singha are proud to announce the return of one of Britain’s most-respected and best-loved comedians, JIMMY CARR 'The Best of Ultimate Gold Greatest Hits World Tour’ - Live in Bangkok, Sat. March 29th at 8.00pm and 10.30pm at The Grand Ballroom of The Westin Grande Sukhumvit. From ฿1800 to front row seats at ฿3500 (no extra fees)! Seats are very limited! 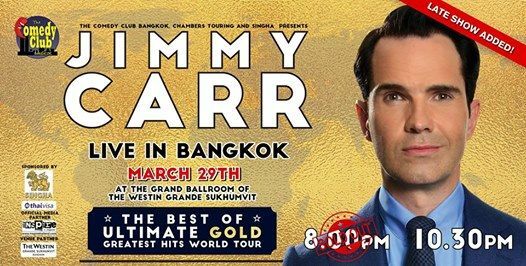 More info on Jimmy Carr!